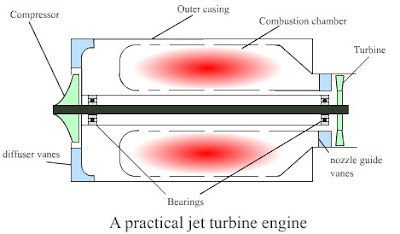 This is the layout of a simple but entirely practical jet engine showing the essential parts. The moving parts consist of a compressor wheel and a turbine wheel linked by a rigid shaft. The combustion chamber takes the form of a wide torus surrounding the drive shaft. An important part of the engine that is generally ignored in simple 'how it works' explanations is the airflow ducting. This takes the form of two sets of guide vanes, one called the 'diffuser' assembly and the other the 'nozzle guide vane' assembly (NGV). The purpose of the diffuser is to collect the air from the compressor, slow it down, and guide it into the combustion chamber as smoothly as possible. The NGV is a set of twisted blades that set the exhaust gasses spinning rapidly just before they hit the turbine. This adds considerably to the effective power of the turbine. That really is all there is to a real (model) jet engine. So it's entirely possible for an amateur engineer with a half decent workshop to make his/her own jet engine. Of course, things are never that simple. Although it's possible and the engineering isn't difficult, it's far more of an Art than a Science. And a deeply black one at that! And you find that works?